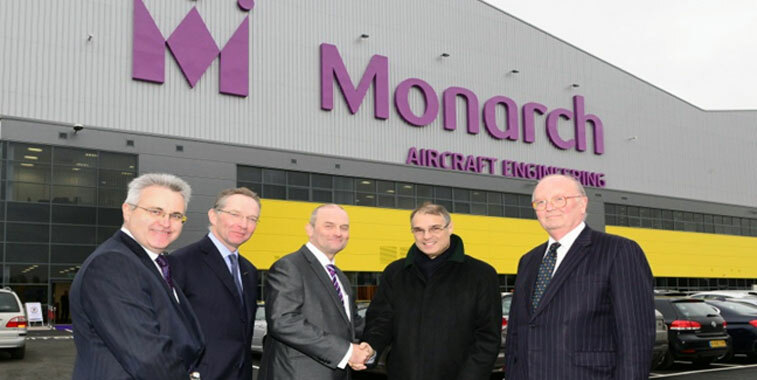 Monarch Airlines, also known simply as Monarch, was a British charter and scheduled airline which later, in 2004, became a low-cost airline The airline's headquarters were at Luton; in addition, it had other bases at Birmingham, Leeds/Bradford, Gatwick and Manchester. It was Britain’s fifth-biggest airline, employing roughly 3,500 employees as of 1 October 2017, and was the biggest airline in British history to collapse. The company held a United Kingdom Civil Aviation Authority (CAA) Type A Operating Licence, which permitted it to carry passengers, cargo and mail on aircraft with 20 or more seats. On 5 June 1967, Monarch Airlines was established by a pair of British businessmen, Bill Hodgson and Don Peacock, while financing was received from the Swiss Sergio Mantegazza family. It was founded upon the ethos of the package holiday, being orientated conveying British holidaymakers to desirable tourism destinations across Europe and the Mediterranean region. Operated as a subsidiary of Globus Getaway Holdings, Monarch commenced passenger operations on 5 April 1968, flying a charter flight from Luton Airport, London to Madrid, Spain, using a Bristol 175 Britannia 300 turboprop. The company grew quickly from strong demand for package holidays; during 1972, Monarch carried 500,000 passengers with the space of a single year for the first time. During 1971, Monarch entered the jet age, procuring a number of Boeing 720B and BAC 1-11 jetliners, these types replaced all of the company's Britannias during the mid-1970s, making the company an all-jet airline.